Using old recordings, Sean Street explores ways we have tried to control the most confusing of dimensions, time itself. From December 2012. 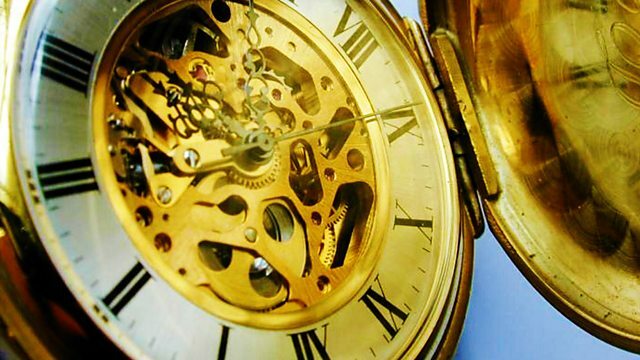 As we prepare to put the clocks back tonight, Sean Street travels back in time through archive recordings to explore the ways in which we have tried to control time itself - from its standardisation in the 19th century, brought about by the railways, to modern day political decisions about time-zones and when Summer Time should start and end. Most of us remember we get an extra hour in bed tonight - but when we get up for work on Monday morning will it be lighter or darker? Why do we bother to change the clocks? Should we change our time-zone and join Central European Time and consign GMT to the past? And what exactly is time? Can it be controlled or does it control us as it marches on relentlessly making us older day by day? All these ideas have been debated throughout the years, but are we any nearer being able to define or explain what time is? With help from curators at the Royal Greenwich Observatory, Sean Street's journey into past recordings takes him backwards and forward across the many time-zones of Russia, into China's single time-zone, to Venezuela's deliberately political adoption of a half-hour time-zone and to Samoa, who recently travelled forward in time by losing a whole day. However, if you want to experience Time Travel yourself, listen to the repeat of this programme tonight on BBC Radio 4 Extra which starts and ends at 1am in the hour the clocks go back! The Time Rebels: how far can we control time?